Big plans today, smashed, as I couldn’t do any research. FTM2014 isn’t “talking” with Ancestry.com, so what I am going to do. Oh, yeah, get organized. 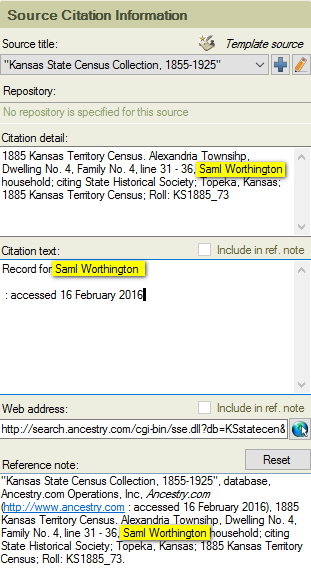 I have been really careful in this 5 Generation file about the Citation’s. Not that I haven’t before, but really working on the format and punctuation that is required. In the past, not so much. Also, making sure that that “accessed date” was included. There is a unique with FTM2014 when using the Template feature about that. Because I couldn’t do any real research, I decided to spend the time looking at my Citations. One thing that I had been doing with this file, is entering the full name of the person in my database, as part of the Citation, as it should. Somewhere along the way, I trying to shorten the accessed date to me “Mar” and nor March. So, I had to check what EvidenceExplained has to say about both. Although not spelled out, the examples were very clear. Then I had my dah moment, of course. The citation will reflect whose record I was looking at, but using the link would get me to THE person whose record I have just found. The examples also had the month spelled out. So, I am now reviewing my 342 Citations. So far, it’s going pretty quickly, not done too bad of a job, but well work the time to go back and clean them up. Get my Citations Organized. I started out in one direction, but changed, base on the FINALLY Get Organized project from DearMYRTLE. My project started by trying to prove or disprove a Mayflower connection. It didn’t take to long that the information suggested by the Mayflower Society at Roots Tech was not going to work. RelativeFinder.org and the FamilySearch Family Tree results had issues. Did a straight line back 17 generations and knew there were issues. So I decided to change that project to a more worthwhile and meaningful use of my time. Just focusing on 5 Generations. I have had other status reports and events as the project has moved along. Because I am giving a presentation at the Fairfax (VA) Genealogy Society in April, I wanted to capture some real data on how the research process I use for Information Overload really works, when I use that process and follow those Shaky Leaf Hints. I have followed 228 Hints and have successfully used 156 of them. Having worked those 155 hints, 57 other hints disappeared, as expected. 14 Hints I have ignored based on the reliability of those hints. They are on my ToDo list if I need hint for those individuals. 2 were not for my person. That was due to limited data on that person in my file at the time I ignored that hint. 107 of the Media files were pictures that I had taken or scanned images that I have in my files. An additional 15 Media files were from the linked Ancestry Member Tree that had Photo Hints. As it turned out many of them were from may main file with 9,000 plus people in it. All of my Citations are in the Template format, meaning that they are very close to the Evidence Explained format. (that is a work in progress). I have no undocumented Facts. Each of those 2,545 facts have at least one citation linked to them. Research Log for each person and a ToDo list with 448 items. 235 Items on my ToDo list, of which 15 are notes about the file in general, not work items. The fun is the stories that are starting to develop. For example, my Great Grandfather and Great Grandmother had 10 Children. At no time was there a census record that found the entire family at the same place at the same time. However, one census record did have a child who only lived a couple of months. Another of the children who died early had a Shaky Leaf Hint that was an Index hint, that actually let to the record that the hint was base on. I had blogged about that From an Index to an Image. Lesson Learned: Having some organization in how I named my files, made my finding those images, specifically, very easy. I knew where to look and new what the filename should be. I have added some of the data learned from the Finally Getting Organized project to my upcoming presentation. In my office needed, I needed a little organization, at least on the Shelf above my computer monitors. I took a few minutes to clean up my act. My lamp for Hangouts is clipped to this shelf just above the right monitor. Coffee is front and center, ready to go. Trello on the Left (main monitor), the HOA on the Right. Wow, what a busy week. I have listed each of the tasks from the DearMYRTLE blog for the week. On the post recent Mondays With Myrt, we talked about File Naming, for our Digital Files and how we file them on our computer. This project of Getting Organized and this new file I am working on, have come together. I am working on my 5 Generation file, staying focused on the Descendants of my Great Grandfather. He specifically, so that I can create a book for my new cousin. I would normally have the Find-A-Grave website pretty high on my list of websites to work on. In this case it is NOT. Mostly because I do a lot of detailed work on the information from that website, especially if there are links to other family member which takes time. I am using the Index Hints from Ancestry.com as a breadcrumb to go to the Find-A-Grave website late. (no ToDo lists for them, because I’ll work off of the Citation List from the Ancestry index. Since I have done a lot of work taking photos and uploading them to the website. I have about 1,600 photos in my collection. Then it dawned on my, I have those photos already organized. But I needed to check it out, and I do. Notice, NO Cemetery Name. That is because I FILE these files by Cemetery. For me, it’s all about sorting. I use an Underscore to make the filename more readable, for me at least. Here Is a screen capture of my spreadsheet on how I track these photos to show it it pays off for me. This starts a column “S” to get to the filename. There are columns for the State, the County, the City, the Cemetery to the left. My spreadsheet is also about Sorting and Filtering. I use these photos for a number of reasons as well. 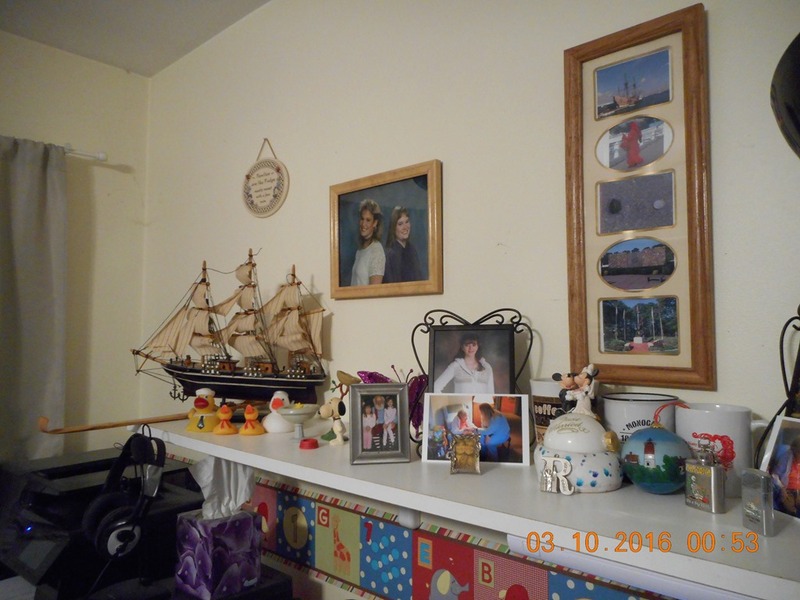 These are my photos but I want to use them for another Blog that I have, for uploading to the Find A Grave website, and for my own use. That is where this organization (for me) paid off. 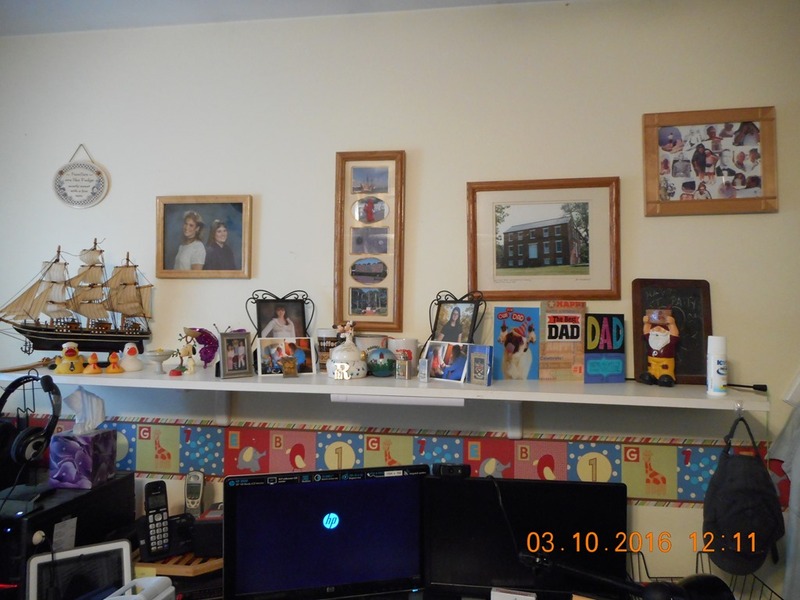 This 5 generation tree is “my folks” many of whom lived within a couple hour drive so I have taken my own photos. You will notice some cells in Yellow. That is how I KNOW that I have added them to file. When I brought these photos into my database I navigated to that Cemetery Folder and selected and brought a COPY of that image into my database. It only took a couple of minutes to get those images into my database. The spreadsheet had the data I wanted in my database but I worked off of the Image that is now in my file. Yes, all properly cited. At the end of the name part of the filename, I will add things like –1, or –plot, or –sign, because when I take the photos, I book end the pictures in the cemetery with a sign or two OF the Cemetery. 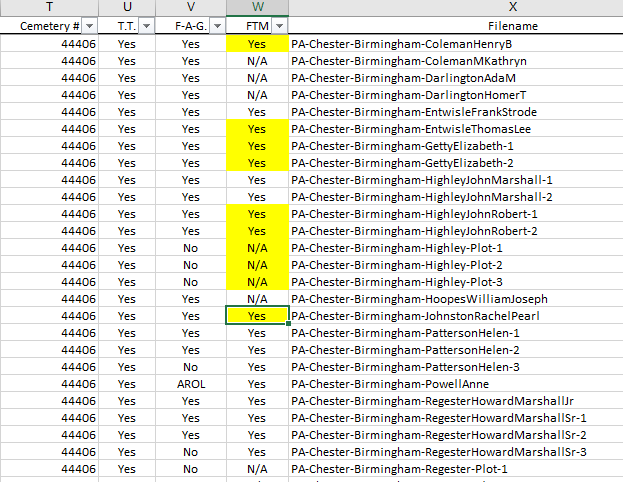 They are also in this spreadsheet AND my database. Do make this work a little easier, I put the photos in Folders. 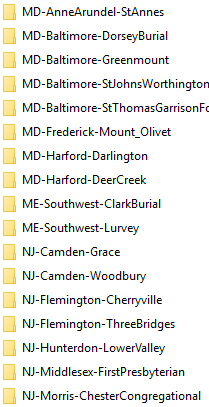 If you can read that image, you will see that I have pictures from 4 different cemeteries in Baltimore County. It has worked for me, to stay at the County Level, and not create a City level or piece of the filename. This system has worked for me, but it took a little thought, and to figure out how best to sort the information. It also helps keeping names consistent. I do a lot of copy / paste of the Filename. I use a Type Once, Paste a lot mindset. 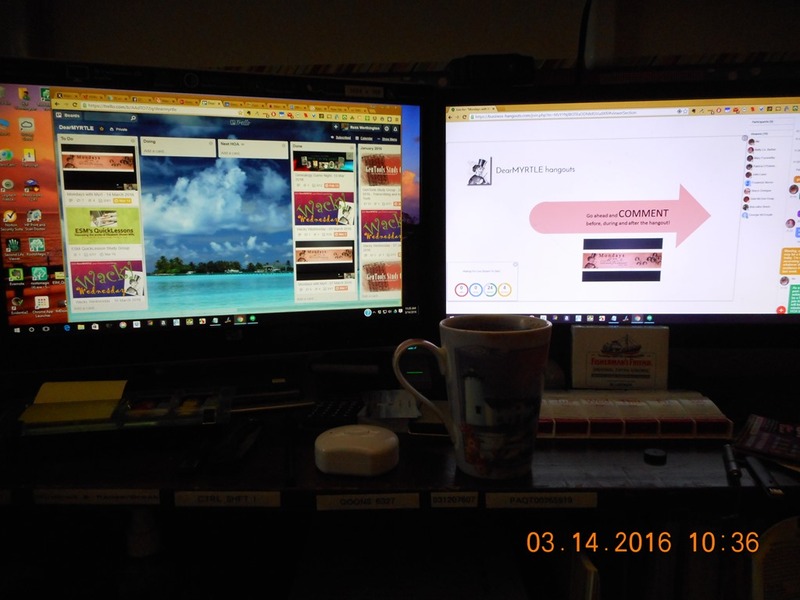 Here is a link to the Mondays with Myrt Hangout I mentioned earlier. Because I started late, doesn’t mean that I haven’t been working on FINALLY getting organized. In fact, I have. I have set aside some time, almost every day, to get “my stuff” organized. Living in an apartment for years, meant stuff in storage or some where away or better said, In The Way. Getting the house in order, gardening, getting those “shaky leaves”, you know the real ones, the grass, and keeping the birds and squirrels happy takes time. With the Christmas break and not being able to do “stuff’ I am taking the time to get the Genea-Cave in order. There has been some fine tuning during this process, but the process is starting to pay off. Now, I have to deal with that issue. So much to do, so little time, as they say. Do I go chasing after that Bright Shiny Object (BSO) or stay focused on getting organized? The pictures are in a number of “albums” / folders on the CD, now copied to my hard drive, so do I go and organize them NOW ?? Letters, photos, new file ? Guess I better get organized. AND I put this thought of creating a Book for my new cousin, in the next month or so. Not to mention the busy schedule that DearMYRTLE has in store for us. 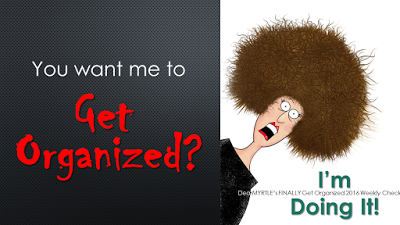 YOU WANT ME TO GET ORGANIZED ??? You are currently browsing the archives for the Finally category.